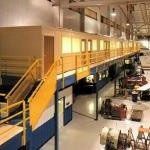 Are you seeking cost effective ways to enhance your space for personnel or material storage needs? Are you maximizing your tax incentives and realizing lower costs of ownership as they relate to capital equipment expenditures and accelerated tax depreciation. 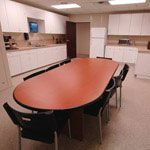 Modular Offices provide custom space solutions designed to meet your specific needs. 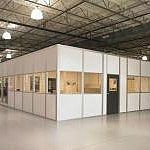 From a single story building to a two-story multiple office complex, these modular offices can be built within your existing facility to allow more efficient use of your existing square footage and in the case of a two story building, utilizes unused vertical space. 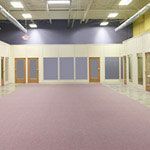 A wide variety of materials, finishes and colors allow owners, architects and contractors the freedom to design offices from high profile administrative offices to industrial applications. They are less expensive than conventional stick built construction. They install quickly with only minimal business interruption. 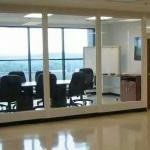 They can be easily modified for your future space requirements. 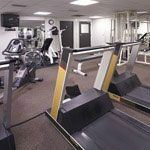 They quality as equipment, allowing for accelerated tax depreciation. 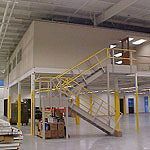 Two-story structures can be designed to better utilize space and maximize your investment. 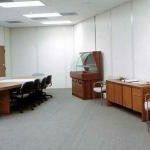 With Starrco modular office systems, you can install quality offices for as low as $20 per sq. 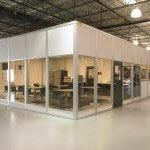 ft.
Starrco modular office systems can save up to 50% of our total project cost compared to traditional construction. 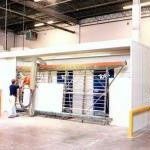 All material is pre-cut, mitered and completely finished, saving you the cost and time of sanding, painting or wallpapering and are completed in about 25% of the time of permanent construction. Built-in electrical raceways for easy installation of electrical, phone and computer wiring can also be provided. 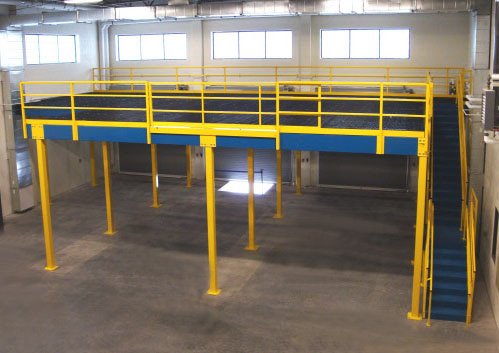 You can drastically reduce your down time with no mess, dust or debris. 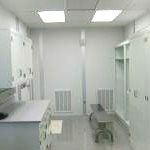 Often, your modular building can be installed over the weekend, ready for occupancy (and work) Monday morning in a clean, quiet, comfortable environment. 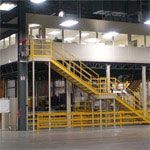 From a two-wall structure to a two-story multiple office complex, every Starrco Modular Office System comes with the Starrco Advantage. Each project begins with a careful needs assessment. 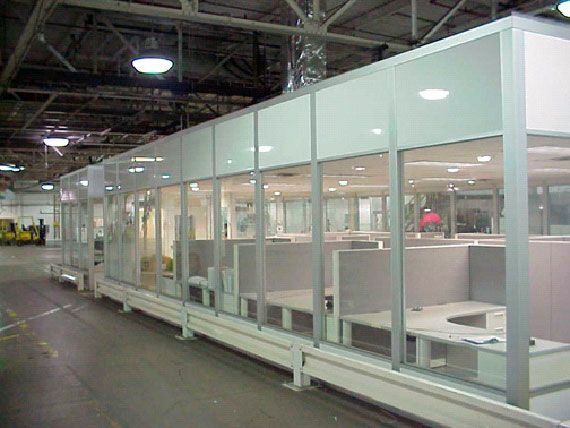 The modular offices are then designed and engineered to precisely fit your application. Tax advantages and significant cost savings over conventional construction. 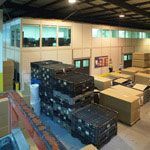 The flexibility to easily and conveniently expand, reconfigure or relocate Starrco modular offices when your needs change. 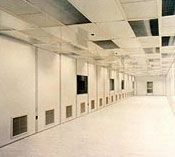 Raceways are built in to allow quick installation of electrical, telephone and computer wiring. 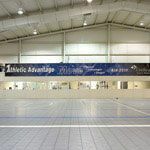 Aluminum track and posts are more durable and will not rust or corrode. 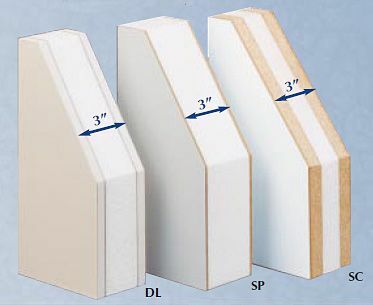 A two-piece wall stud design allows panels to be easily removed or replaced. 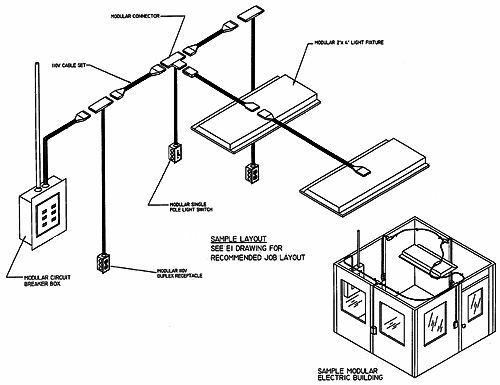 Detailed CAD drawings along with individually labeled components make your installation fast, easy and completed in a fraction of the time of conventional construction. All materials are pre-cut, mitered and completely finished. 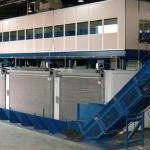 Installation is completed quickly, with minimal mess, dust and disruption to your operation. 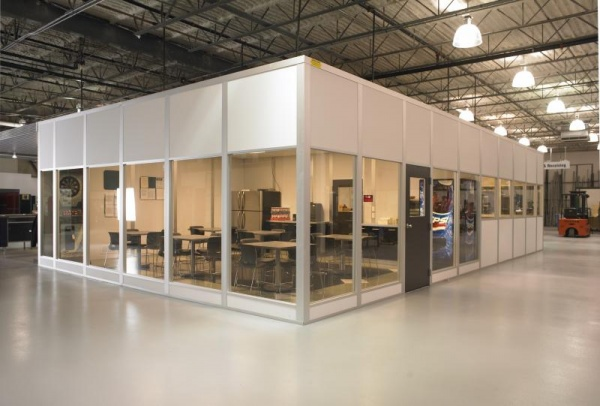 When you choose the Starrco Advantage, you"ll get custom designed modular offices that are pre-engineered and manufactured specifically for your needs. Starrco door frames lock into studs, eliminating movement and allowing for smooth, hassle-free operation. Low profile design allows them to be flush with the wall surface. Starrco offers 100% modular electric package. Other modular packages need some hard wiring. 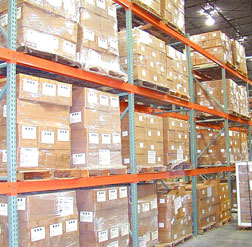 Starrco components and hardware are all 100% pre-cut and notched. No one else prep's their product for ease of installation like they do. Starrco is the only company to offer a modular central HVAC system. 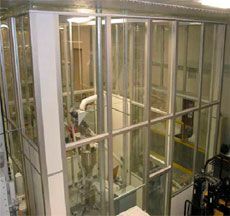 Starrco is the only company to have our systems fire retardancy tested. 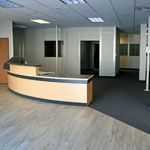 Whether it is a 2, 3 or four wall, one story or two story modular office you need, all materials come completely finished, labeled, and complete with CAD drawings to allow for quick and easy installation. 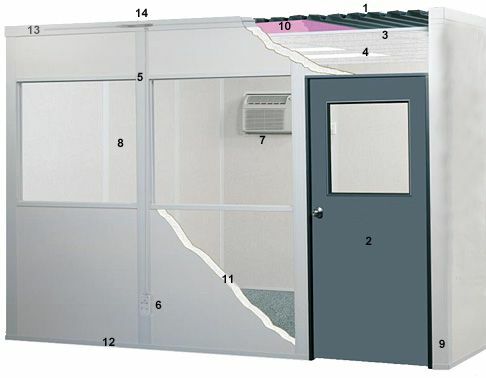 3" wall panels are available in three styles, all of which are made to be completely self contained so the modular office can be reconfigured if your needs change. These wall panels are available in three standard colors: Khaki, White and Grey. 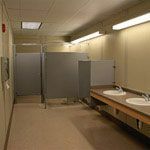 Optional wall finishes such as painted aluminum, painted steel, fiberglass reinforced plastic are also available. Vinyl covered gypsum board interior and exterior/rigid polystyrene core. Vinyl covered hardboard interior and exterior/rigid polystyrene core. 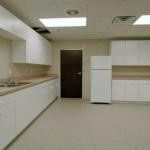 Vinyl covered hardboard interior and exterior/high density particle board substrate and a rigid polystyrene core. All stud types are designed to accommodate easy vertical installation of electrical, data transmission and communication lines in the stud raceways that are easily accessible by removing the cover plate. 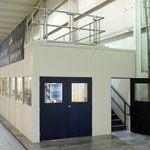 SS3500 Modular Office Studs - are made of structural grade extruded aluminum and act as a structural column where extra support is needed such as long clean spans, two story structures and load bearing roofs. When additional load bearing capability is needed, steel tube inserts can be inserted into the studs. 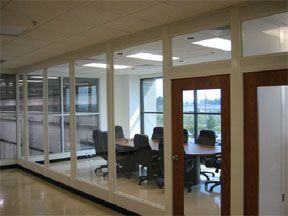 SS3000 Modular Office Studs - are also made of structural grade extruded aluminum and have a two piece design that will allow both sides of the stud to be equipped with electrical, data transmission and communication lines. Both studs styles will allow you to remove and replace wall panels without having to disturb adjacent panels. As your needs change, the system can be easily revised and reconfigured. Choose from two door styles, commercial grade steel or wood, both of which come with a unique three piece steel frame that will never get out of square, and ball bearing hinges that allow for smooth opening and closing of the door. 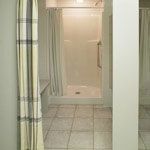 They come standard with a 1/4" tempered safety glass window in the top half, which meets all applicable ASTM and ANSI standards, but can be ordered without if you wish. Starrco Door Frames - Door frame locks into stud eliminating movement, allowing for smooth, hassle-free operation. Low profile design allows them to be flush with the wall surface. 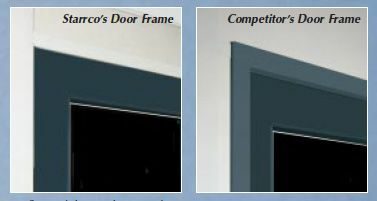 Competitor"s Door Frames - traditional drywall style door frames can require constant adjustment. Usually protrude 1/2" from the wall surface. Available in same three colors as wall panels, khaki, white and grey, so they can match, or contrast, whichever you like. Choose from either standard field wired components or Starrco"s exclusive modular Quick-Tric pre-wired electrical package. Quick-Tric is a completely pre-engineered electrical system that is designed to quickly and easily snap together for installation in your modular office. The connections are all color coded and safety keyed to lock together in one direction only, making it virtually impossible to incorrectly connect the system. Please note however that a few local electrical codes do not allow pre-engineered electrical components. The local building inspector should be consulted prior to ordering to determine if any code restrictions apply. 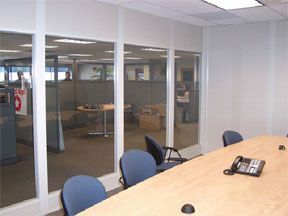 Some modular office manufacturers offer also offer modular electric packages but, unlike Quick-Tric, they require the installer to wire the connectors to the electrical devices in the field. 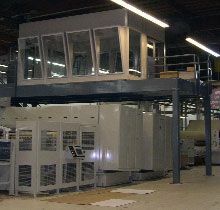 The Quick-Tric system comes from the factory with all components, including the panel board, wired with the modular connectors.